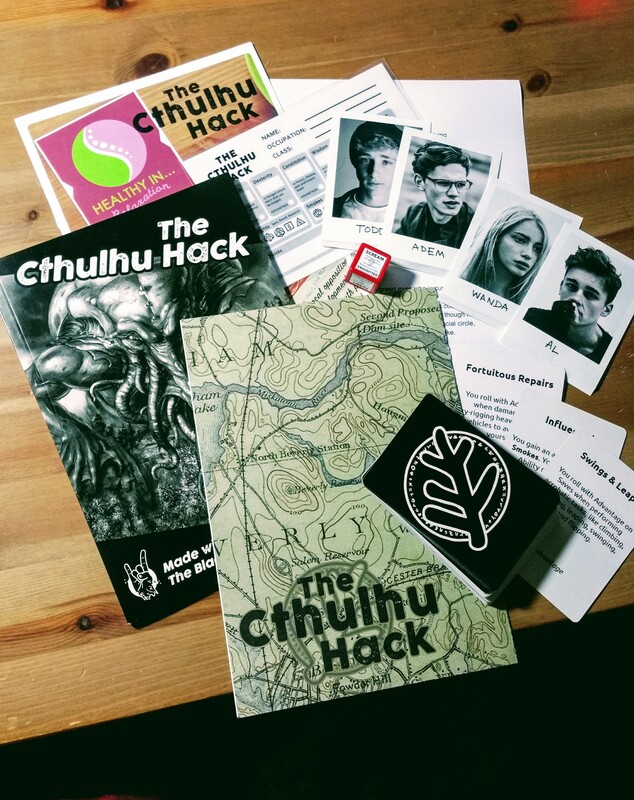 Just a brief one, as I noted The Cthulhu Hack got a mention alongside The Black Hack in the TableTop Games 10 Top Roleplaying Games of 2016. In addition, someone rightly pointed out that in Cthulhu Hack 2016 and Beyond I did not mention the GM Screen amongst the upcoming releases. OK – now I have mentioned it. I had a rough version of a screen in-hand for my game at Dragonmeet (the artefact in the middle of the picture with the map cover), but that really was something of an Alpha prototype for me to toy with. The prototype gathered some key tables from the core rules and From Unformed Realms. It proved useful in running Save Innsmouth, to hide some brief notes and the game booklet itself. I hope that any official and final GM Screen will serve a more original and pivotal function on the table. That remains a work in progress for the time being, with no specific release date. I also didn’t mention that I have an adventure supplement planned for late Spring that will gather together three short adventures themed around the same non-Mythos entity. I can’t go into much further detail than that at the moment. The call for adventure last year offered some interesting ideas – and one of those formed the kernel of a concept for this supplement. This is still early thinking, but a full text for one adventure exists and I had a chance to discuss the second at Dragonmeet with another writer. I will round the collection off with the third contribution, which currently runs to an undeveloped outline. All of these adventures will clock in around 5,000 words – so, they should all be punchy numbers ready for a session of play.